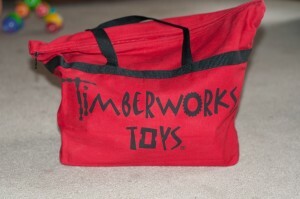 Home » Featured » Timberworks Toys Review!! In our house, blocks are the great equalizer. They are one of very few toys that ALL of our children can agree on, and will happily play together. As a mother, I absolutely love when I find a toy that brings joy to one of my children, but when I find a toy that makes all three of them happy, I am ecstatic! Timberworks Toys caught my eye nearly a year ago. 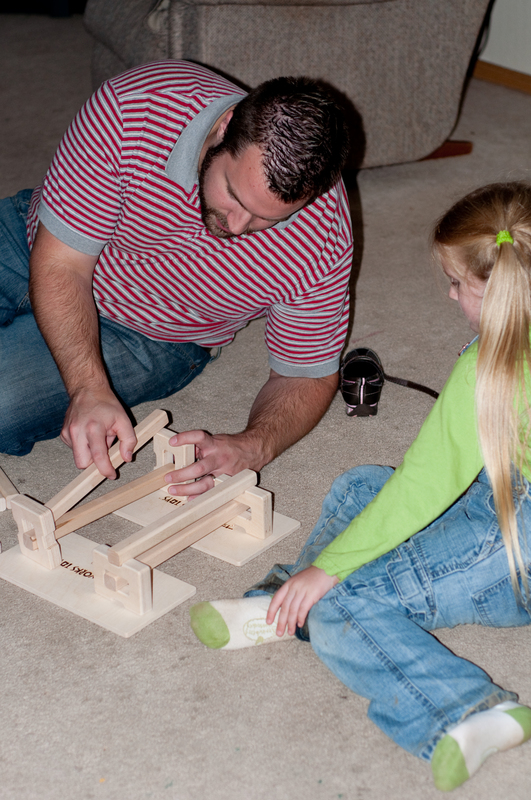 Timberworks Toys offers AMAZING block sets to delight and inspire children of all ages. 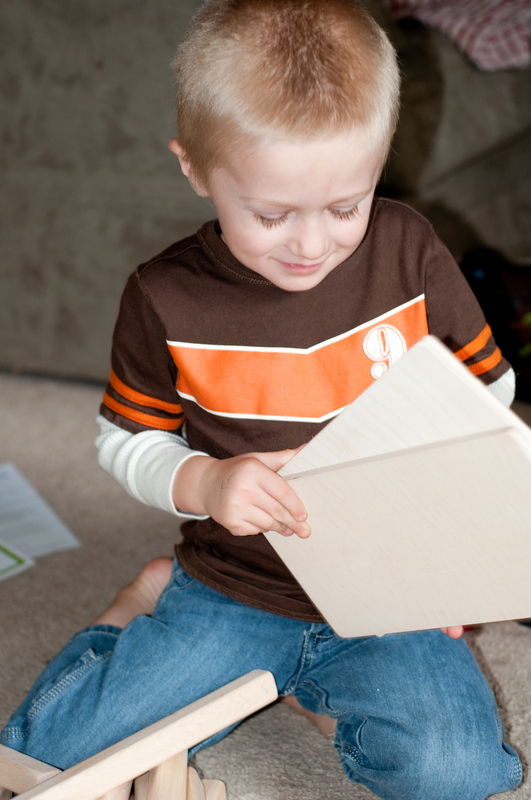 Master carpenter Chris Heston, has developed a line of high-quality wooden blocks that truly are designed to let your child’s imagination run wild. 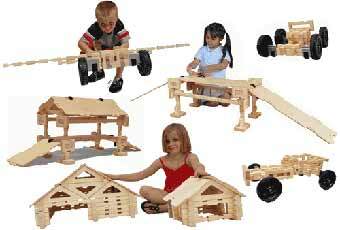 Many of the sets offered by Timberworks Toys include widgets, wheels, and large timbers to stretch your child’s creativity and allow them to design a wide array of structures….We had houses, castles, a zoo, a corn maze, an airport, a hotel ,and a racetrack in the course of a few hours at our house! This handy little tote bag allowed my son to keep a set of blocks in his bedroom (which thrilled his little three year old heart!) I LOVE that the blocks have a home and can easily be found at playtime. 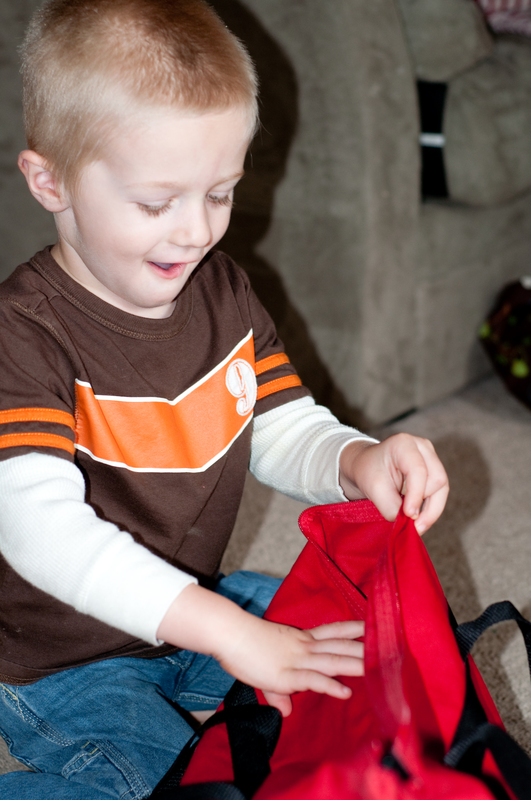 When this bag arrived, my son was SO excited to see what was inside. I LOVED seeing my kids dive right into playtime, ignoring the tv, the computer…..in exchange for a chance to use their creativity and imagination using solid, high quality, classic, and amazingly well-made toys. Place a set of building toys in front of a child, and just watch….watch the magic….the endless possibilities….AND, the unique building components from Timberworks Toys truly allows your child endless building potential…These blocks take your child WAY beyond the average house or tower! My husband was quick to jump in and begin building with the kids as well! Building toys allow us as parents such a unique opportunity to play alongside our children. We get a window into their little creative minds, and get the pleasure of working with them to create something beautiful. I loved that David was able to come up with things to do with the Beautiful Building Blocks that were completely different that my ideas. You can purchase the Beautiful Building Blocks HERE. I also HIGHLY encourage you to take a look at the other AMAZING building sets Timberworks Toys offers! Check out their full line of products! AND, Timberworks Toys is offering an exclusive discount for Chasing Supermom readers! When you call or email them to place an order, simply mention that you heard about them on the Chasing Supermom blog, and you will receive 15% off your entire order, and FREE shipping anywhere in the US! (Awesome right?!) These block and building sets would make an excellent Christmas gift! Head on over to the Timberworks Toys Website and see for yourself the amazing line of products and resources they have to offer! You should also “Like” Timberworks Toys on Facebook for exclusive deals and information! This looks very durable, shopping around for more creative toy idea this holiday.. thanks for the review!